We've been out in the field for 6 days. T'was absolutely fantastic. One of the key reasons for taking this job was the chance to get out and see proper Antarctica. BAS is unique among Antarctic operators in offering winter trips to all wintering staff, not just those with scientific projects in the field. There are two reasons why: 1. Winter trips are essentially survival training. Everyone operating away from base, even for a single day, must carry and know how to use survival equipment. This benefits scientific work as more trained personnel means more people available for off base work. 2. They’re great fun! 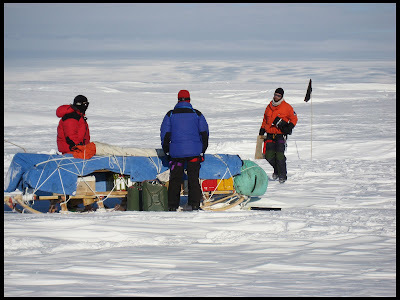 With these two objectives in mind, Sledge Bravo (Sune, our guide, Tom, Alex and I) spent a glorious Monday packing our bags and lashing the kit boxes to our Nansen Sledge. The BAS field system appears beautifully Heath Robinson, but works exceptionally well having evolved over 50 years. It’s based on a number of colour-coded wooden boxes classed as “radio” (red, military spec HF field radio) “pots box” (blue, stove and lamp), “tent box” (yellow, plates etc), “inside food box” (white) and “man-food” (wooden). “Inside food” contains luxury items such as frozen helpings of Ant’s excellent food, nice tea bags and plenty of cake. “Man-food”, a box packed with army-esque dehydrated rations, was named so to avoid confusion with dog food when Huskies drew the sledges. Today six petrol cans take the space formerly occupied by dog food boxes, but the name remains. Rescue equipment was stowed beneath our skidoo seats and personal bags lashed to the load rack. By dinner time, we were ready. The Antarctic weather is a fickle thing. Tuesday dawned with dense fog and sub-500m visibility. We moped about making final checks and drinking tea until the sun rose and the visibility lifted at around 11. Ready to go, we fired up the skidoos and headed east. We were all riding ‘field doos’, specially prepared Bombardier Alpine 3s with studded tracks, GPS navigation and a meaty 550cc two-stroke twin motor. The fiery motor initially proved difficult. Solid sastrugi (wind blown frozen snow) forced us to travel slowly to avoid damaging the doos, but as two stoke motors work better at high revs, progress was quite jerky. 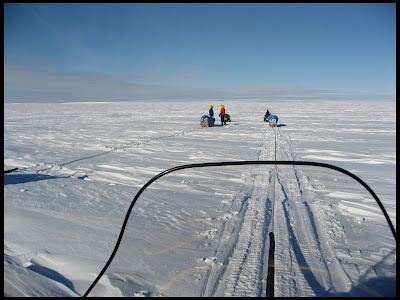 After 20kms we linked the skidoos in pairs allowing one rider to rescue the other should he fall into a crevasse. With only 5km to go before reaching camp, we approached a steep ridge. Hitting it square-on at full power, Sune and I cleared the top with no problem. Alex and Tom weren’t so lucky, the steep slope and bumpy snow tipping both their sledges. Weighing in at 600kg each, it took all four of us to right them and a tow from Sune to get the unit re-started on the steep bank. Setting up camp took a good two hours as we wanted to make it absolutely bomb-proof. 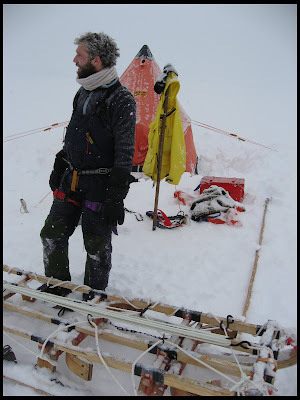 First the soft top-snow was dug away, then the icey surface levelled before the tent could be set. Inside the tent runs a central board holding the “pots”, “tent” and “inside food” boxes. Bedding of karri-mats, thermarests, sheepskins, down-sleeping bags and fireproof blankets are chucked down each side and only then can the kettle be put on. Now _THAT_ is what I call camping! How is the hair surviving old man? What with your advancing years and all that hat wearing and nasty weather it must be fading! I won't even pretend that I remembered your birthday I'm just copying off the other comments!! Have you grown a beard yet? I seem to remember some of your previous attempts being pretty poor but since you’ve got 18 months down south I don’t reckon you have any excuse now!